Kedah is a small state in peninsular Malaysia, at the northern end of Malaysia's west coast, bordering Thailand in the north and including the Langkawi archipelago. A Hindu-Buddhist kingdom existed in Kedah already in the 1st century AD. This was annexed by the Srivijaya empire in the 7th centuryandin the 11th century by the Indian Chola kingdom. In the 15th century the local ruler converted to Islam. After being part of Siam, Kedah was transferred to the Malayan British colony in 1909. 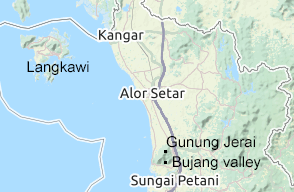 The regional capital of Kedah is Alor Star. Half of Malaysia's rice is grown in Kedah. Tourism is mostly focused on the island of Langkawi; other sites in Kedah (Ulu Muda, the Bujang valley, Alor Star, forest and mountain areas) have tourist potential but are not well known outside Malaysia. Alor Star and Langkawi have airports. It's also possible to reach locations in Kedah by train, bus or car. Accommodation options include hotels and pensions, all bookable via the international booking portals. Prices are moderate.